Did you have a nice week-end? Maybe get a bit of the snow that fell in the South? Here in NH the weather was beautiful with absolutely no snow. I think most New Englanders are enjoying the mild winter but we also know Old Man Winter could throw us a curve ball right up until April Fools Day! Oh how I hate it when that happens. Two Sundays ago I cut some Forsythia from our backyard to bring in and force. On Valentine's day, last Tuesday, it finally started to blossom. Here it is almost a week later and their golden-yellow petals are still gracing my windowsill. I thought you might like a peek. The board behind the flowers and canning jars is a piece of driftwood I found at the beach last summer. I love that it's so weathered and beat up with nails still attached. My husband also found a piece of driftwood which was slightly longer and thinner but I haven't figured out where that one will go yet. Over by the mason jars you'll also see a clear, almost beehive shaped container. That holds my dish detergent. The container was only a few dollars and I found it at Homegoods. So much more attractive than a plastic bottle, don't you think? Last month I decided to put away my winter hand soaps and bring out the summer scents, given to me as a gift last year on my birthday. 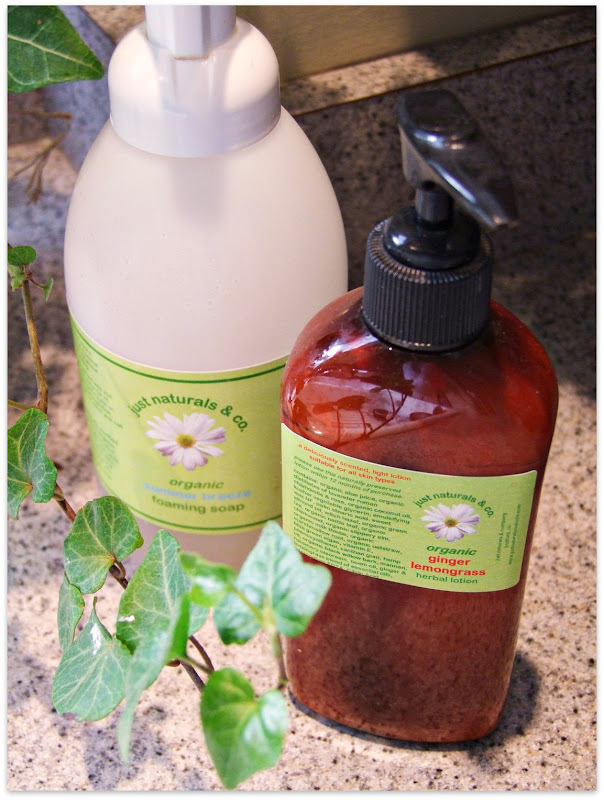 They're made by Just Naturals & Co and I love them both! The foaming soap is Summertime Breeze while the lotion is Ginger Lemongrass. Oh goodness they smell divine! You have such an eye for design! Do you design or decorate others homes too? 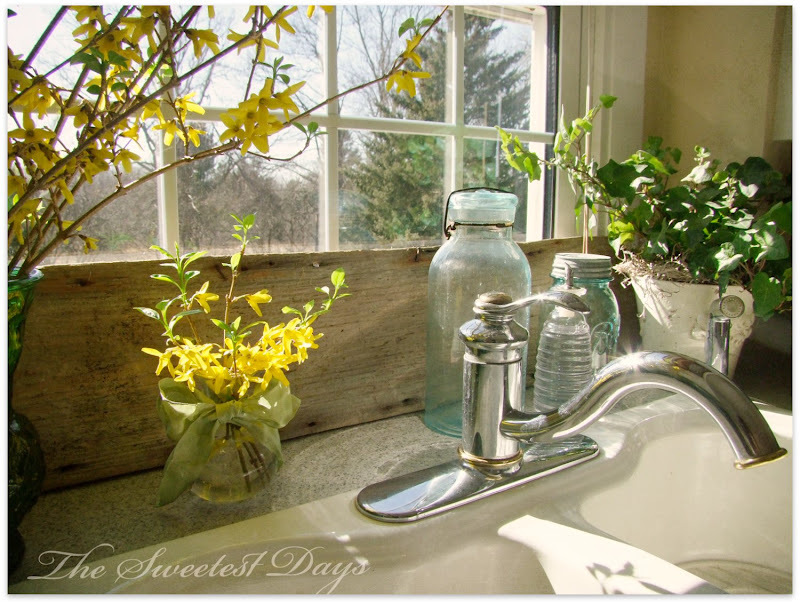 That forsythia is so pretty, and I like what you did with the driftwood and I really like that Mason jar soap dispenser. I want to get one of those! P.S. I bought some of your prints from Red Bubble over the weekend. I can't wait to get them and frame them and hang them up! Can't wait for my forsythia! Certainly won't be this week, but perhaps next week I can cut and force a few branches of it. Very pretty photos today, Sharon! One good thing about our New England curveballs in spring, though, is that they do not stay on the ground as long. If we miss any major snowfalls another two weeks or so, the sun will be high enough to do more melting work for us! 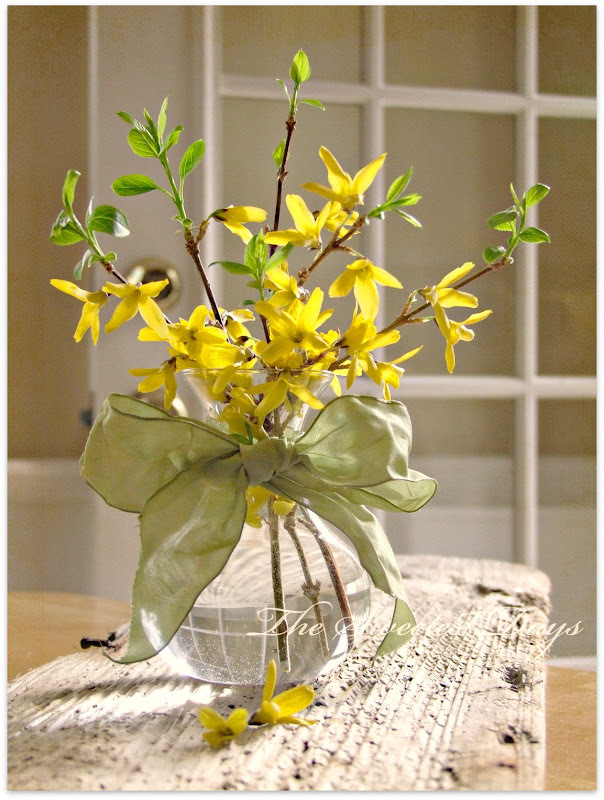 LOVE the forsythia. Even in my apartment, I have a rustic shelf that goes above my faucet, with my blue mason jars. I just LOVE them, so I'll have to look for that soap dispenser! Beautiful. I love our forsythia outside, though trimming is a project. But I don't have enough good sunny window spots with something to set the plants on to bring any in to force. So I will enjoy yours for now. With this mild winter ours will be blooming soon enough. 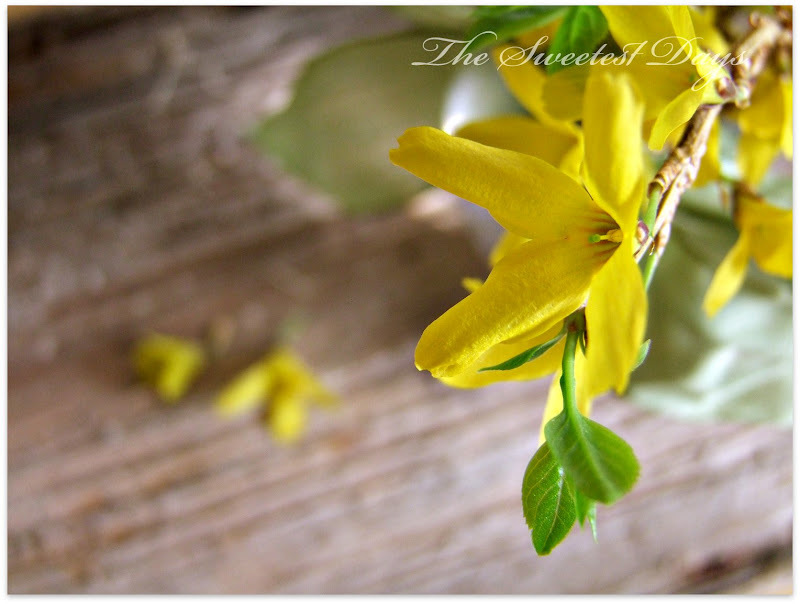 The forsythia is lovely... can't wait for spring to arrive! Such a great place to have flowers, making dishwashing more enjoyable. I love the yellow flowers with your curtains. 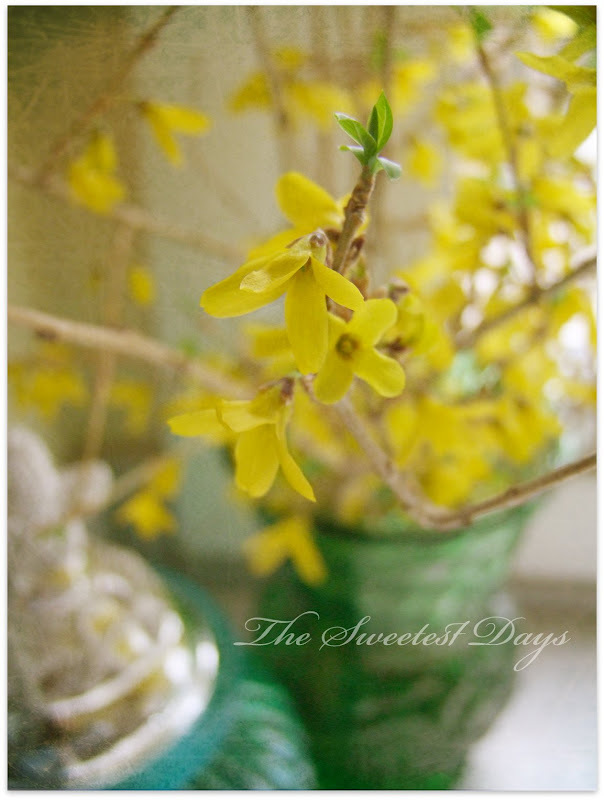 Hello Sharon....I love forsythias and to see them on your kitchen shelf in February is just delightful! Who wouldn't like doing dishes at your house??? That's a pretty nice sink area. Gorgeous photos, as usual. How cheerful! I have a violet plant on our dining room table that has been blooming for months now. It's so nice to have flowers in the house, during the winter season, isn't it? BTW, we got a fresh snowfall today - big, fluffy flakes. It sure looks pretty. Your photos minister to my soul and so make me miss my home town in Massachusetts. Love the South, but some New England things just don't happen here. Hi Sharon!! You have forsythia already! Two weeks is pretty fast for the blossoms to open and they do look so cheery in your kitchen. I will have to cut some quickly to force. Almost spring! And hey, I love your S6 shop! 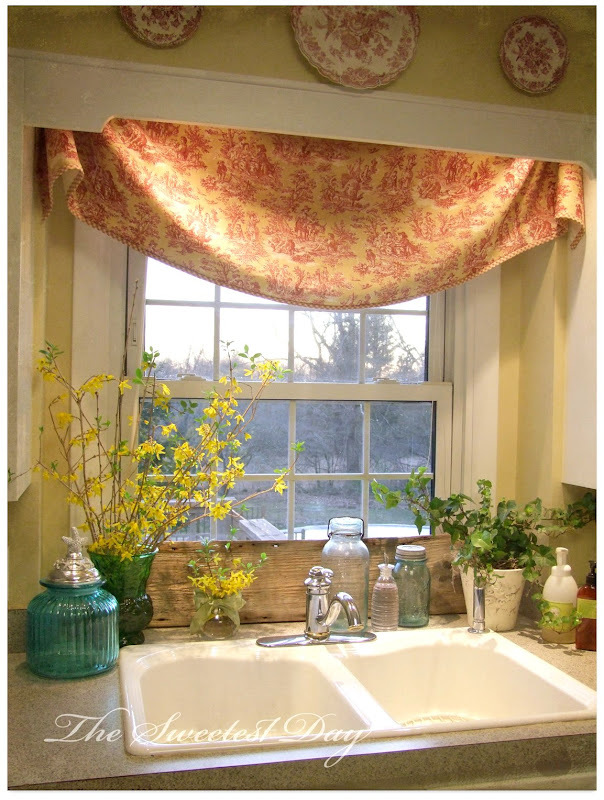 I love your kitchen window!